Benson Idonije is Nigeria’s most revered music critic and first manager of Nigerian Afro-Beat legend, late Fela Anikulako Kuti. 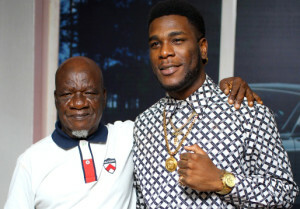 He’s also the grandfather of Burna Boy, a Nigerian reggaedancehall singer and songwriter, whom he never wanted to go into music. Today, grandpa is the grandson’s music director. Category: Articles | Tags: Benson Idonijie, Jahman Anikulapo, PASS Lagos | Bookmark: permalink.